Studies: atmospheric CO2 concentration drives climate change. August 2, 2012. Despite its catchy name, Marine Isotope Stage 11 (MIS 11) is not a science fiction film but, instead, a climatic regime similar to our own that that endured from 424,000 to 374,000 years ago. During MIS 11 the world's orbital configuration, atmospheric greenhouse gas concentration and fauna resembled their current state, encouraging researchers to develop high-resolution climatic reconstructions of the period. Nevertheless, despite the quality of existing climatic reconstructions uncertainty has persisted regarding the major drivers of contemporary climate change. A new study by lead author S. Das Sharma, published in latest issue of the Journal of Geophysical Research, employs novel statistical techniques to interpret 15 climatic indicators - like pollen records - in a quest for the primary cause of the warmer MIS 11 climate. According to the authors, the results "unequivocally" establish that atmospheric carbon dioxide was the key influence behind the warmer climate of the period, with important consequences for our understanding of the relationship between anthropogenic greenhouse gasses and today's changing climate. The article in the Journal of Geophysical Research may have received significant media attention, but another study exploring links between atmospheric carbon dioxide concentrations and modern warming won front-page coverage because of the associated conversion of a prominent climate change skeptic. 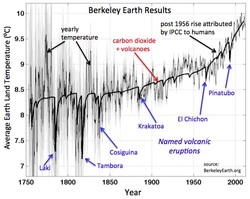 Richard Muller, founder and scientific director of Berkeley Earth Surface Temperature, had long doubted the science behind widely accepted reconstructions of global warming identifying anthropogenic greenhouse gasses as the primary culprit. To Muller, the complicated models many climatologists employ to analyse the reams of quantitative data compiled by global instrumental data were overly complicated and opaque. Hence, Muller assembled a team composed primarily of physicists to test the models and projections of, for example, the Intergovernmental Panel for Climate Change (IPCC) by simply matching fluctuations in temperature to changes in possible climatic influences over the past 250 years. The results, freely available online, precisely chart both the conclusion of the Little Ice Age and today's warming trend. Moreover, they reveal that changes in the concentration of atmospheric carbon dioxide precisely match fluctuations in global temperature. Of course, matching similar trends in quantitative data can do little more than suggest correlation; to really establish relationships beyond a reasonable doubt sophisticated models or, in historical research, qualitative (documentary) accounts are necessary. Nevertheless, after spearheading a study to cast doubt on global warming that, in the end, ironically supported the IPCC's long-standing conclusions Muller was ready to change his mind. Writing in the New York Times, Muller described how, "last year, following an intensive research effort involving a dozen scientists, I concluded that global warming was real." After the new study, Muller explained, "I'm now going a step further: humans are almost entirely the cause." For more on models, instrumental data and climatic reconstructions see: Edwards, Paul. A Vast Machine: Computer Models, Climate Data, and the Politics of Global Warming. Cambridge: The MIT Press, 2010.